Welcome to the student platform here you will find useful links for working at home. Espresso offers a range of content and tools that is simply unrivalled. It covers all year groups and subjects, plus whole-school initiatives such as SEAL and Healthy Schools. 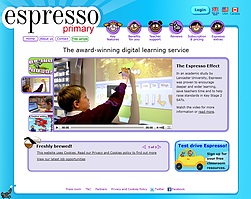 Designed with both teachers and pupils in mind, Espresso is a resource that can be teacher-led or facilitate pupils working independently in a safe online environment. Click HERE to go to the Espresso website. Use your PASSWORD and USERNAME to login (Check your school diary for your login details). MyMaths offers a fully interactive mathematics learning solution from level 2 to A-Level. Everyone can enjoy 24 hour access whether at school or at home. CLICK HERE to go to the MyMaths website. Use your PASSWORD and USERNAME to login (Check your school diary for your login details). If you are having problems logging in to the websites please contact the school HERE.